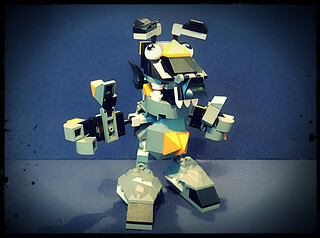 We’ve been acquiring Lego’s Mixels as part of our weekly shopping expeditions. At £3 each they feel like good value for money, especially on a Friday and especially considering that the last Lego minifigures series saw the price bumped up to £2.49 for just a single figure. 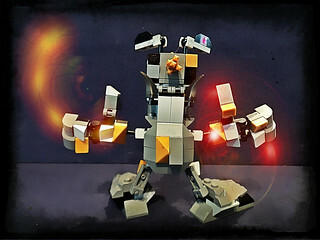 The Mixels are exceedingly satisfying to build, and adorable. From a disassembly and reuse point of view they’re also ace. Lego have introduced a set of brand new hinges which will doubtless prove handy, and there are loads of nifty and unusual bricks in each set. We’ve got all of the first wave and are fighting the shoplifters in Tesco for wave two. The Lego website has some nice suggestions for Maxs (combined Mixel teams) and Murps (building across teams), all of which can be downloaded as PDFs. So far I’ve only made the Cragsters Max so far but I enjoyed it. There were a lot of bricks left over though, so I felt obliged to tamper further… he needed ears and thumbs as a bare minimum. I’m really looking forwards to wave 3! 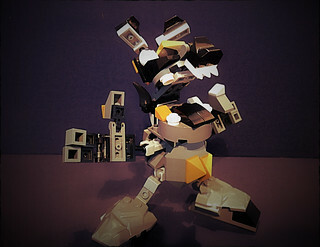 I’m enjoying the Mixels too. They’re just right for a quick build.